ST. GEORGE — A winter weather advisory has been issued for higher elevations across Garfield, Kane, Beaver, Iron and Washington counties starting Wednesday evening. 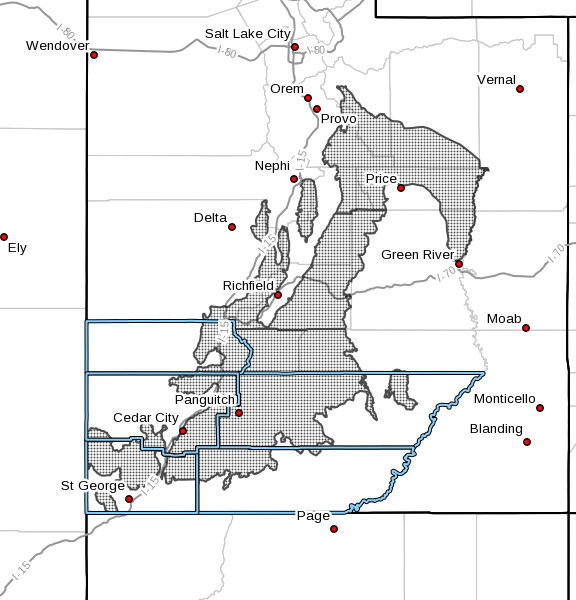 Snow totaling between 7 and 17 inches is expected from between 6 p.m. Wednesday and 6 a.m. Friday across the areas of the Wasatch Plateau, Book Cliffs, central mountains and southern mountains. That includes the cities of Scofield, Cove Fort, Koosharem, Fish Lake, Loa, Panguitch and Bryce Canyon. The highest accumulations are expected in the southeast. The NWS advises that travel could be difficult, particularly over higher elevation routes. Some common routes that could see challenging travel conditions include state Route 14, US-89 between Hillsdale and Glendale, state Route 12, Interstate 70, U.S. 6 and U.S. 191. A winter weather advisory for snow means periods of snow will cause primarily travel difficulties. Expect snow-covered roads and limited visibility, and use caution while driving. Be aware of road conditions. The Utah Department of Transportation recommends checking CommuterLink for road and weather conditions before leaving home.